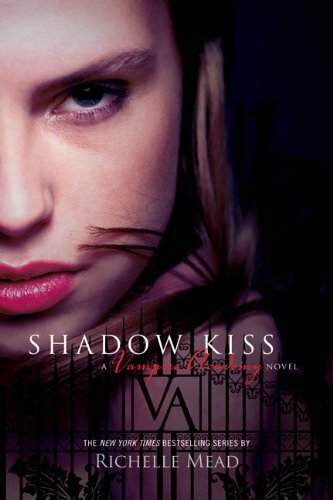 My Thoughts: Shadow Kiss is the 3rd book in the Vampire Academy series by Richelle Mead, and even though Richelle Mead gives a quick summary of everything that has taken place in the first two books, you just have to read those to fully appreciate Shadow Kiss. The choice of title is perfect: once you have finished reading the 3rd book you'll understand exactly why this title fits perfectly and how it describes the story. Shadow Kiss is the most intense novel of the series so far: the emotional intensity and depth Richelle Mead makes Rose explore are extraordinary. In my opinion Shadow Kiss was the best book in the series (so far): the plot was layered and I enjoyed that there were several storylines, the characters who got "screentime" really made the most of it (Adrian is a fantastic new, funny and original character) though I would have liked to see even more Christian/Rose scenes (I have a feeling these two are so similar they should become great friends). The relationship between Dimitri and Rose evolves and I loved the intensity of Dimitri's feelings, something we got more and more glimpses of all through this 3rd book. I very much enjoyed how in Shadow Kiss Richelle Mead spent some time on vampire politics and exploring different ideas about reform. Rose did some (self) examination of guardians and dhampirs and her own role and life within the system she has known, and was good to see her question some of the things/facts she grew up with. And finally Lissa managed to redeem herself after the big disappointment and anger she caused to me in Frostbite. :-) Even though she wasn't a character I was particularly interested in, in Shadow Kiss Richelle Mead spent more time developing Lissa's character and showing us tidbits of her personality, thoughts and feelings, and I have to say, I found her interesting! When trying to choose which character I particularly liked, I discovered that I have many favourite characters: I loved reading every scene Christian was in, especially his bantering with Rose, that was a high of the novel; then there is Adrian, another extremely entertaining character, whose flirting with Rose I was always looking forward to, just loved reading Rose's sarcastic dry comments to his chivalrous, charming ones :-D Even though I'm all for Dimitri, I would like to see more of Adrian as I think he is a very exciting and complex character, and I would love if Richelle Mead explored him in more deatil. Then there is of course Dimitri. Strong, powerful, solid rock to Rose Dimitri, who is opening up more and accepting his love for Rose. The conclusion of Rose and Dimitri's love was beautiful. At the end of Shadow Kiss I had the exact same feeling I had when seeing the last episodes of Season 2 of Buffy. The heartache, the sorrow and the resignation to surmount the pain just for a little more. My heart broke to see Rose having to go through another devastating grief so soon after *he who shall not be named for spoiler reasons*! What I enjoyed the most in Shadow Kiss was the emotional intensity: Rose's fears about not being able to handle the side effects of Lissa's magic, her guilt over Mason, her growing love for Dimitri and then the ultimate heartbreak and devastation (which I'm sure Richelle Mead will still be able to up in the next book) were wonderfully done, it took the reader on an overwhelming emotional journey. Shadow Kiss was an addictive read, not only I gobbled it up in 2 days, but I lived and breathed with the characters.